Baby Signing the Fun Way ... Online Resources! SIGN IN / REGISTER HERE ! Looking forward to singing and signing with your baby? 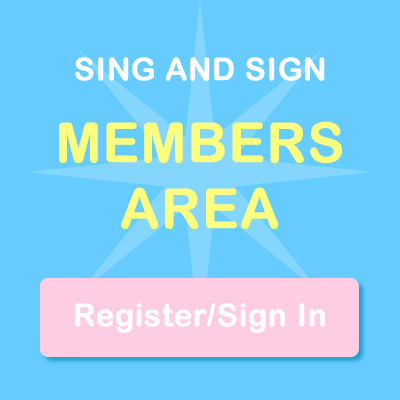 Why not become a member of 'Sing and Sign Online' (known to our class attendees as 'The Jessie Cat Club') our comprehensive resource to support you as you sign with your baby at home! Unique resources, videos, singing & signing, games and more ... You can even select and print out single or multiple sheets of your baby's own favourite signs to share with family and caregivers. Have access to our teaching videos which take you step by step through our curriculum, alongside our original multi award-winning DVD 'Sing and Sign'. Your membership is valid for a whole year and you can access the streamed material and print out the signs as often as you like. Within the site you can upgrade your membership (one-off cost £15) to access much more Sing and Sign material, including our much loved follow on DVD content and play Jessie Cat's next level interactive hiding game with seventeen animal friends! Registration costs £25 and lasts the whole year with as much access as you like as you learn online. When you register as a member of Sing and Sign Online, you'll instantly be sent an email with an automatically generated password to allow you to access your membership immediately. If you wish to alter this password for future visits, you may change it when you first log on via the Settings Page. Your baby's own signing resource. As your baby starts to communicate more and more, you will be keen to share those exciting first signs with family and friends. By following a simple procedure, Sing and Sign Online members can print out a page (or as many pages as you like!) showing the signs your baby enjoys the most. This is invaluable for times when your baby is being looked after by another family member or by a childcare provider. A 'favourite signs' sheet is a great way to involve all the family in your baby's enjoyment of the signs and to keep a record of your baby's' first words' forever! !